Drake is a very handsome young man ready to take on the world! This fifteen month old is full of energy and loves to play, play, play! He is a very smart and good-natured boy and he is quickly learning the ropes at his foster home. Drake is crate trained and housebroken with the exception of some marking, which should stop with his recent neuter and as he becomes accustom to his new surroundings. He is great with other dogs his size and with kids, although he is a spirited pup that could accidentally knock over a toddler. Due to Drake’s age and high energy level, he will be best placed in a home with a sibe-savvy family that will continue with his training. 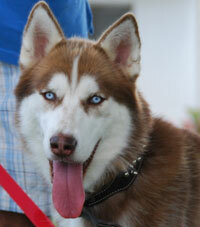 He will definitely benefit from a canine playmate to entertain and keep him out of trouble. True to his breed, he is very alert for any opportunity to escape and explore the world and must be in a home with a sibe-proof fence to keep him safe and sound where he belongs. If you are up for the puppy challenge and have the time and patience to devote to Drake, please complete our online application. He is going to be a wonderful family pet!